Polka Dot Overload | Sewing, knitting & vintage projects, tips, tutorials and cartoons! 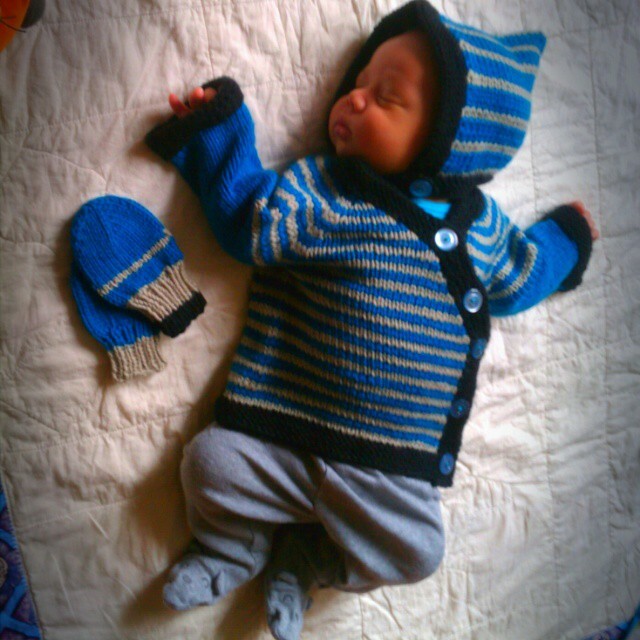 : Baby D wearing stuff I made. 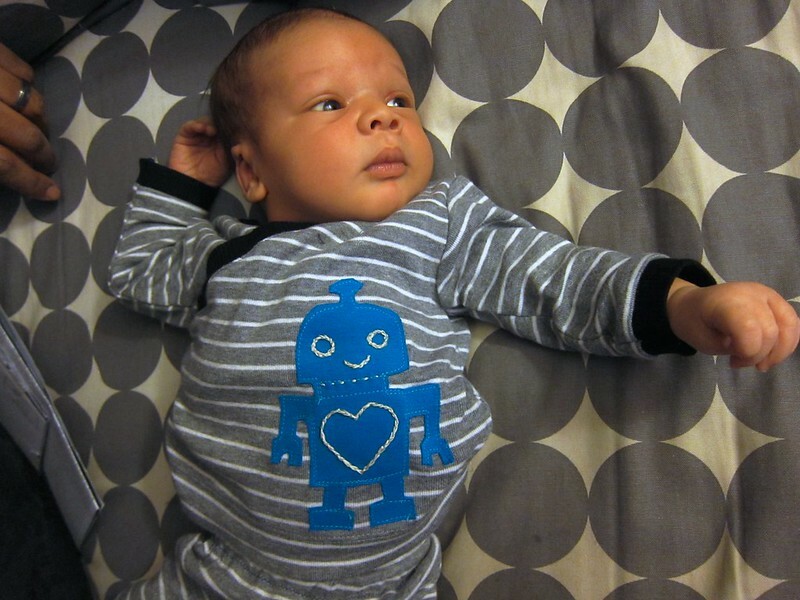 Baby D strikes a pose in a me-made kimono top with robot appliqué. That he is already outgrowing. 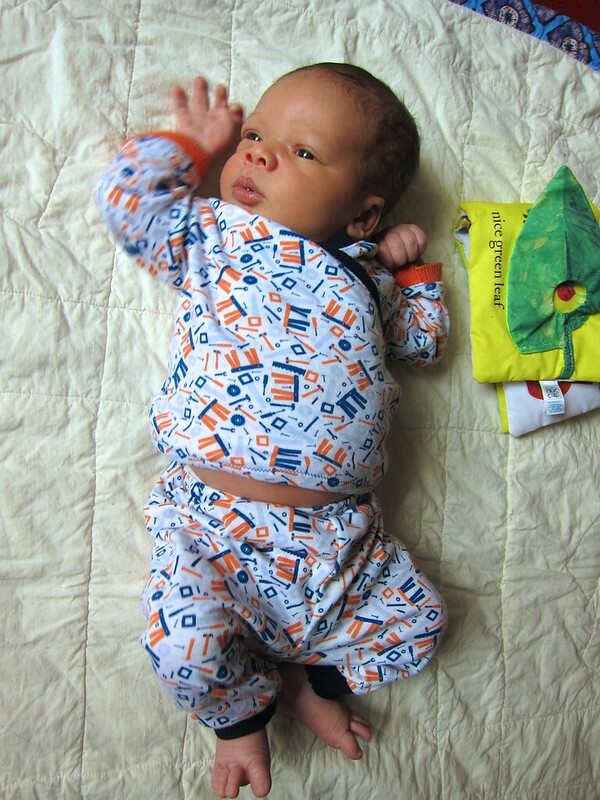 Presenting a photo roundup of Baby D wearing stuff I made him while I was pregnant. I'm too sleep-deprived to form too many actual sentences, but man do I LOVE getting to actually put this snuggly little guy into things I sewed or knit (which I have been Instagramming pretty regularly, if you like that sort of thing). 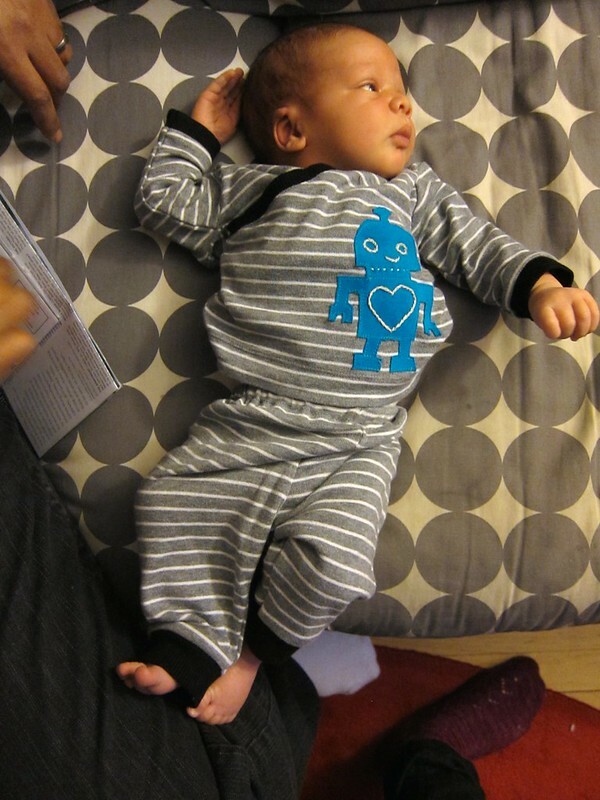 The little dude is growing RAPIDLY (at not-yet six weeks old, he is over 12 pounds and wearing RTW size 3-6 months), so I'm trying to get as much wear out of the things that fit or almost fit as I can before it's too late, since I am NOT having more babies. 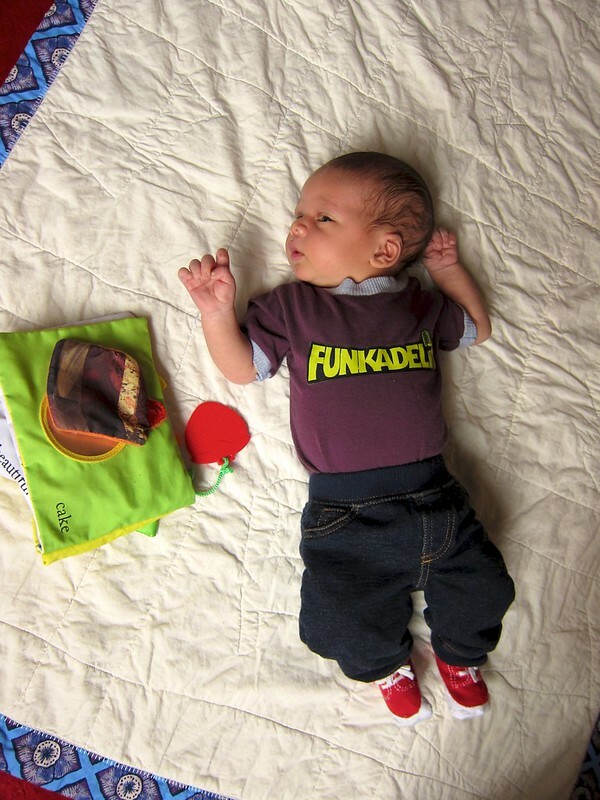 And the Funkadelic one-hour bodyshirt (matching photo with his Daddy's Funkadelic pending), which I originally sewed for his sister. Also: how cute are baby jeans? These are from the thrift store, not me-made, but I love that they have totally useless rear pockets because: jeans! on babies! 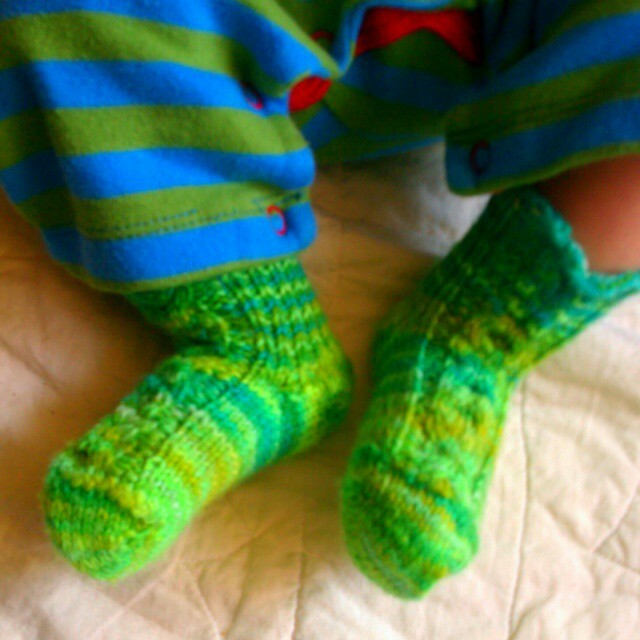 I'm afraid I only have crappy Instagram camera phone photos of these handpainted handknit Better Than Booties cable socks and the Gift Wrap baby sweater and bonnet, but still! Serious chubby cheeks, I just love them. P.S. I mentioned in my last post we were having some horribly painful breastfeeding challenges due to tongue tie, lip tie and oversupply. I am happy to report that things are MOSTLY better (thanks to two wonder lactation consultants and an ENT). I can actually nurse now without screaming and crying in pain (which made it impossible to go out and nurse in public without screaming and frightening the passersby). I may even start doing some occasional pumping this week to get the little guy comfortable with bottles for when I go back to work in a few months ... which would mean husband and I can go out on a date next time my parents visit! 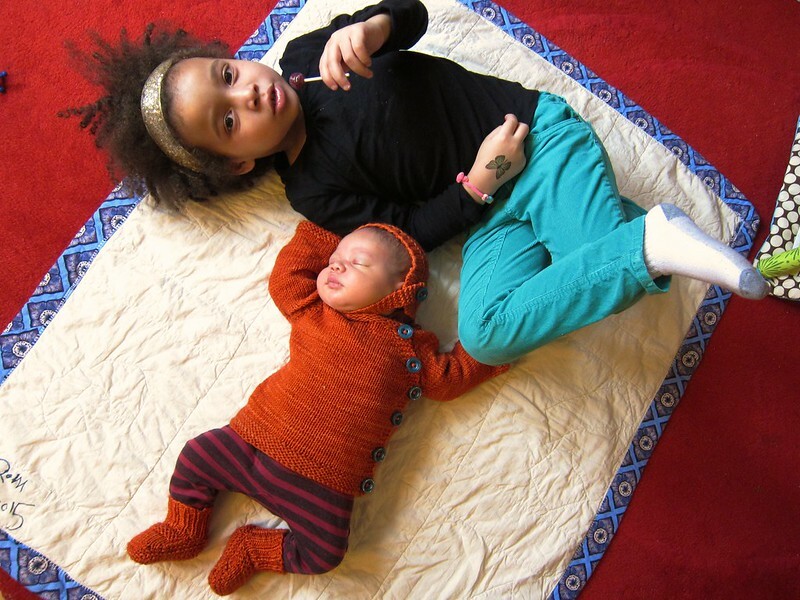 Your me-made kids and clothes are adorable! Glad to hear the feeding is getting better, I had problems with one of my kids too and oh, it was hard to keep going through the pain! OMG - the pics of the 2 kids together are terrific! 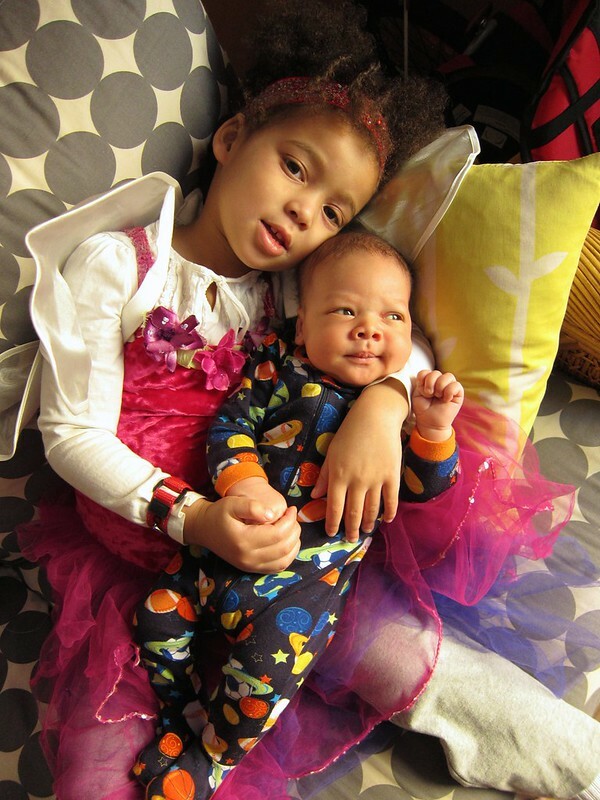 So sweet to see siblings get along and it gives a real sense of how much Z is NOT a baby, but a big girl :-) And D's cheeks are the cutest. I want to bite them (but not in a bad way). 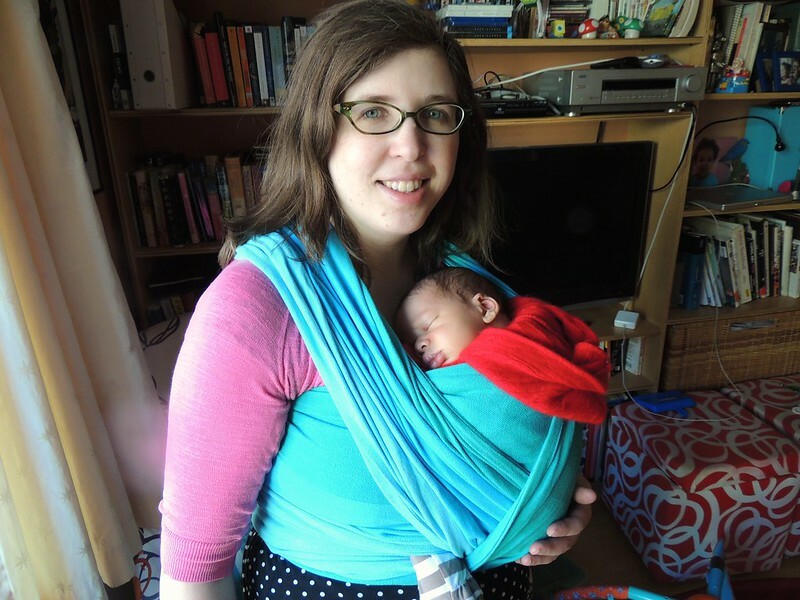 My own kid was a very long, very slender newborn. Of course, she was lovely, from my maternal perspective, but I wanted some rolls. When she hit 6 months she went on an eating spree and got slightly chubby. And then I had to stop myself from biting her little cheeks. He's just gorgeous (as is Z)! So glad things are going better with nursing for you all. 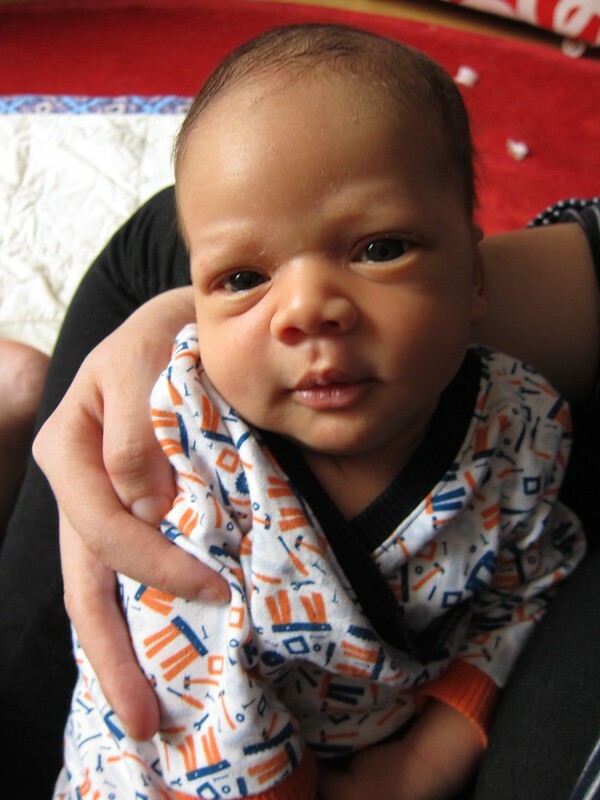 Thank you for feeding my baby photo fix. I'd repay the favor and sit for you, but I'm on the wrong side of the country for that. Baby jeans! Damn, now THAT's adorable. 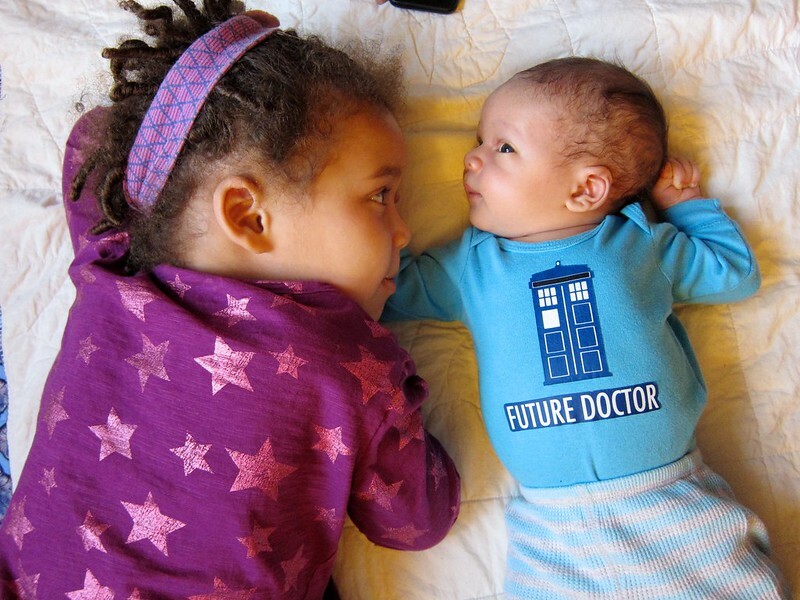 Between you and Cation Designs, some serious baby nerd stuff. Awe you have some BEAUTIFUL children!!! 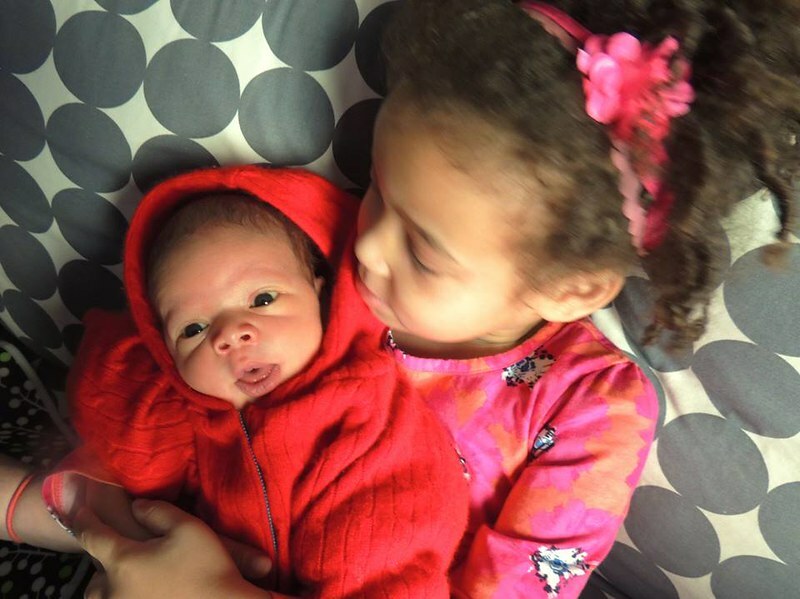 Your kids are the cutest! And how is Z looking so grown up all of a sudden?! I think you're doing terrifically well, taking so many pics and writing a blog post... Thanks for sharing. Aw, thanks everyone for the kind words!!! He is so, so adorable. He is delectable! 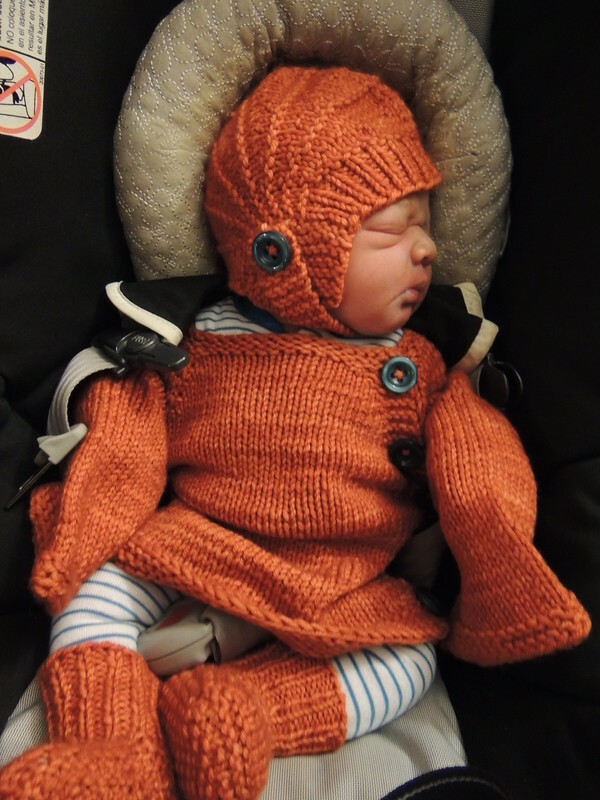 Love babies in hand knitted sweaters! Mikhaela! Your kids! My heart is BURSTING from the cuteness! I really can't take it!!! Baby D is SuperCute. He'd look fantastic in a paper bag - and he looks totally wonderful in mom's creations. Looking forward to seeing him grow. I love everything! Your babies are so beautiful! Too scrumptious. All his homemade clothes are fan. I particularly adore the doctor who outfit. The clothes are adorable! Especially the TARDIS one.